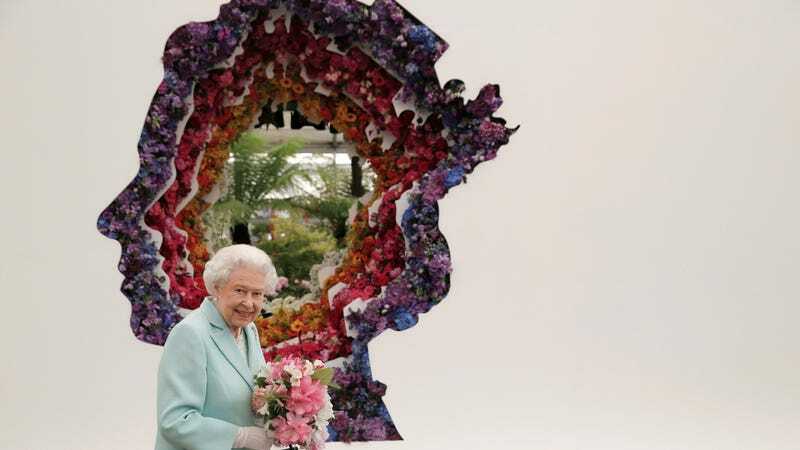 The Royal Horticultural Society’s annual Chelsea Flower Show is getting underway in the United Kingdom, and today press and VIPs got a special preview of the elaborate, often whimsical gardens. The Queen was there, as well as assorted other royals and also cake queen Mary Berry. Greeting visitors upon arrival: an installation of 300,000 knitted poppies, which The Guardian reports originally began as a project by a pair of Australian women who wanted to make 120 for a Remembrance Day commemoration. Jerry Hall and Rupert Murdoch were there. Why wouldn’t they be? And check out this getup worn by a model at the M&G Investments Garden. No idea what’s happening here but I’m into it. Other impressive pieces “include an acoustic garden, inspired by the percussionist Dame Evelyn Glennie; a garden inspired by mathematics and algorithms, and brought alive by mini Einstein lookalikes; and a Pullman train carriage in a planted station,” according to The Guardian. There’s even a “Low Allergy” garden, featuring plants that aren’t supposed to aggravate anyone’s seasonal respiratory difficulties. Among the show gardens is the Modern Slavery Garden, featuring a series of doors, plantings and an oak tree symbolising the English oak under which William Wilberforce stood to dedicate his life to ending slavery in the 1800s, by Juliet Sargeant, the first black designer in the show’s 103 year history.